The work offers the experience of a getaway from the daily life and the rush of Taichung City. It is an escape to an imaginary world, completely separate from reality. A world of sculptural quietness which stands in contrast with the theatrical and colorful world of the opera. 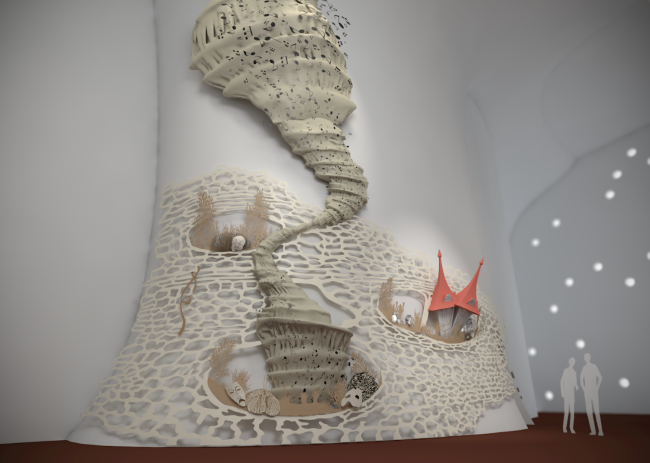 The shape of the “Sound Cave” designed by architect Toyo Ito led me to think about caves, stalactite and stalagmites caves, and underwater caves. This place has a primordial atmosphere and evokes a feeling of calm and drama embodied in the shapes made by nature, unlike the events that take place on the stage. 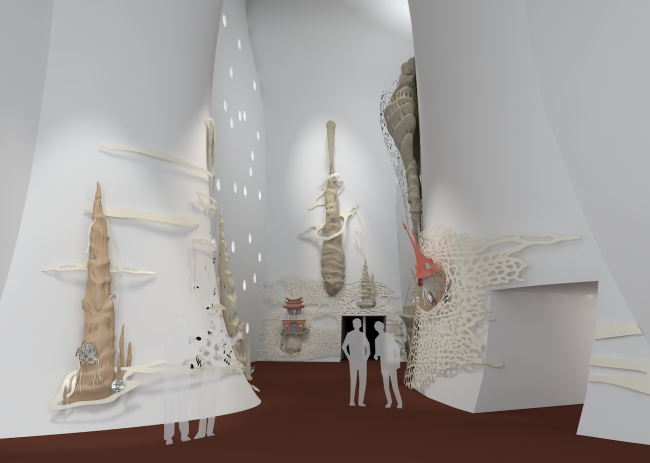 The cell-like shapes from which the works emerge organically continue the cell morphology of the architectural construction, which serves as the bedrock for elements of stalagmite and stalactites and corals. Among the natural and amorphous shapes there is an abstract reference to two architectural structures in the city of Taichung: Taichung Chishan Gate and Taichung Pavilion. My proposal introduces an air of mystery from the hybrid world that incorporates Chinese and Italian masks culture – a symbol of the theater and the opera the building houses. Diamonds were also incorporated, shining as magical treasures that emphasis the feeling of glamour inherent to the nightlife. 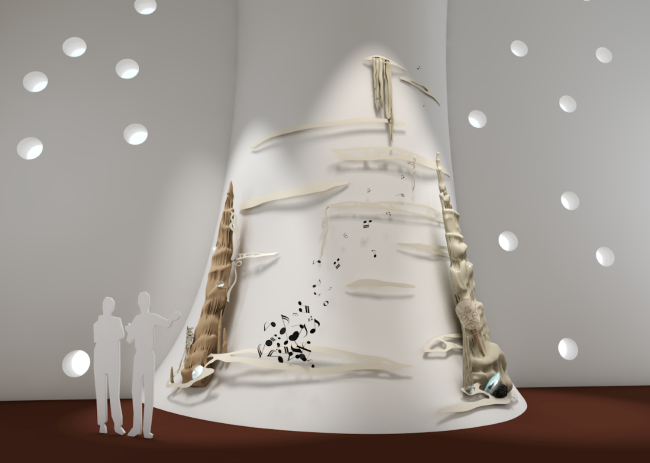 Musical notes that look like they rise from the works add music and imagination to the atmosphere of the “sound cave”. 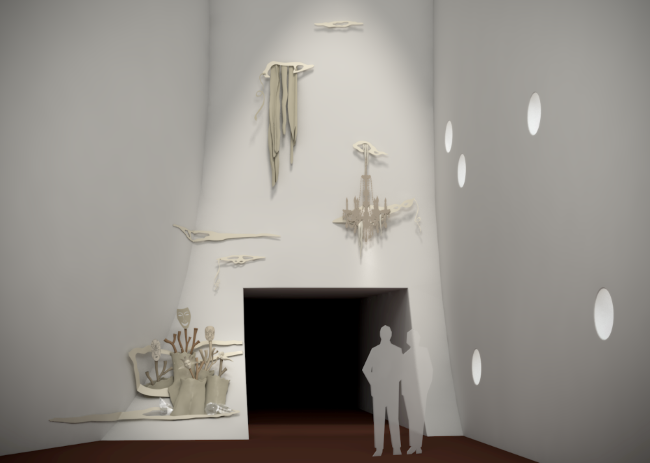 The palette of the proposed work is monochromatic in pale shades. The distancing of the elements from the wall and the employment of frontal and back lighting will enhance the interplay of light and shade and the volume of the work. 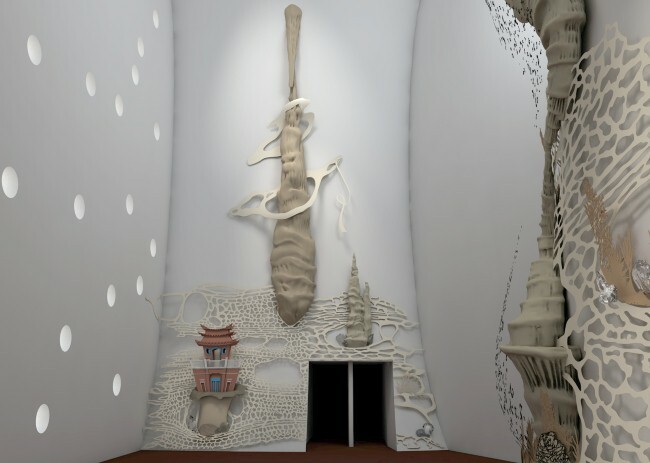 The viewer who climbs the stairway and walks through the foyer before entering the hall will experience wandering full of marvel and excitement as he discovers the sculptural elements, thus enhancing his emotional experience before the performance.